Over the past few days I have been doing some research while waiting for paint to dry on various projects and one book really stood out from the rest. 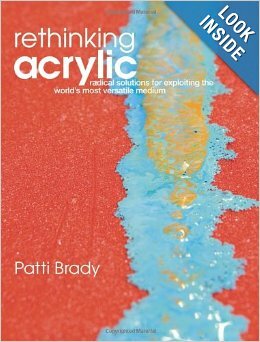 “Rethinking Acrylic: Radical Solutions for Exploiting the World’s Most Versatile Medium” by Patti Brady had some techniques I am very familiar with while others were quite mind blowing. A few of the techniques covered in the book I look forward to incorporating into my aesthetic over the coming months while others provided some tricks to some pesky inconveniences I had to work around. My favorite techniques covered in the book that I must try are staining with some of the oxides, using plexiglass as the support, molding acrylic objects, and engraving. Perhaps the most mind blowing thing I discovered in the book is that acrylic once dry can be subtracted from. Care must be taken of course, however some of the mediums can be sanded or chipped away to reveal paint beneath. Tags: acrylic, art, artist, artistic process, arts, collage, design, fine art, making, paint, pattern. Bookmark the permalink. Previous post ← False Prophet Nears Completion!